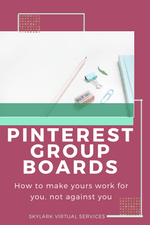 When you start using Pinterest for business, there are the steps to take – set up the account, create some images and some boards to pin them to. Maybe sign up for a scheduler like Tailwind and decide how many pins to add each day. 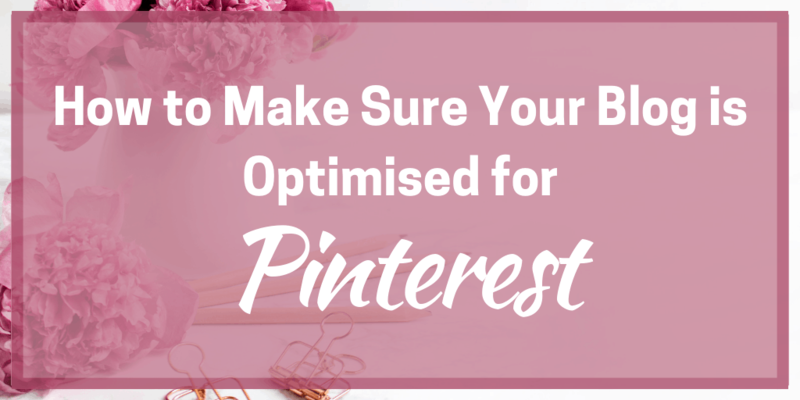 But there’s one important step that often gets overlooked – making sure your blog is optimised for Pinterest. So today’s mission is to make sure your blog or website is up to the job! What does ‘optimised for Pinterest’ mean? Don’t panic if the phrase ‘optimised for Pinterest’ fills you with dread. It is really a series of simple little things, some of which are optional, and others are part of good practice in general. 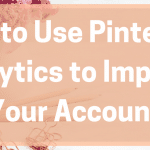 But by making sure you get them in place, you can ensure your website is going to help your new Pinterest account in any way it can. Before you start working on optimising your website for Pinterest, I would look at optimising it for SEO – search engine optimisation. 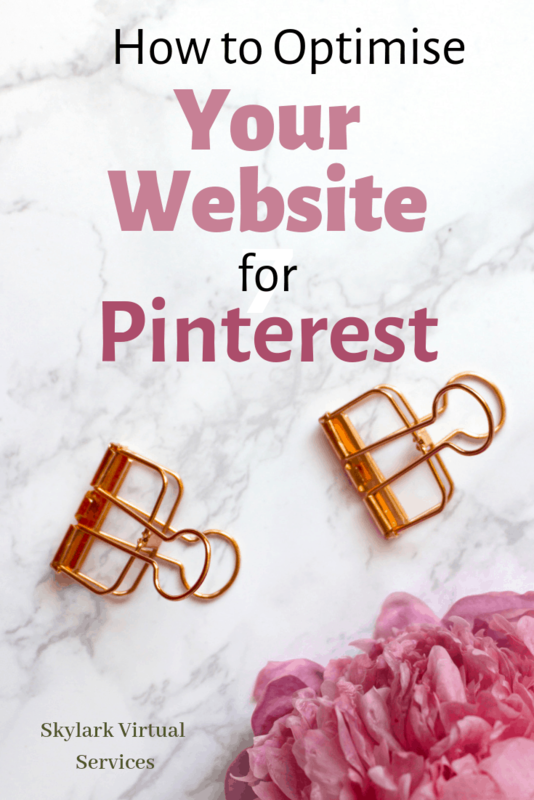 As much as I’m a Pinterest fan, I don’t want to put all those traffic eggs in one basket and just get traffic from the site. For all of my sites, I get about the same amount from organic traffic and from Pinterest – and that’s means having solid on-page SEO tactics. 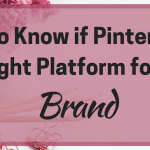 Now you have a firm foundation to get getting that organic traffic, you can start looking at optimising for Pinterest. The core of this is having something to pin – at least one ‘perfectly pinnable’ image for your post. 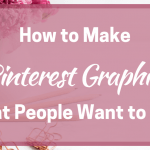 We’ve talked about what makes a great Pinterest pin and what you should include in your graphics before. But think about what makes your pins stand out – eye-catching images, clear and readable text and everything scaling down perfectly for mobile users. 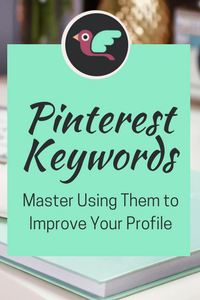 Once you have your Pinterest image, give the file a description – I often use my post title because the keyword is in there. If you make more than one, use other main keywords in the file name. There are lots of ideas about adding images to the post. For me, I add one Pinterest image at the bottom of the post. Other images in the post tend to be square or horizontal because that’s what looks good in my theme. You can add more than one and hide it using HTML code but always be aware that images can slow down your site. I always compress mine before adding them. And any additional pins I make go straight into Tailwind, not on the post. 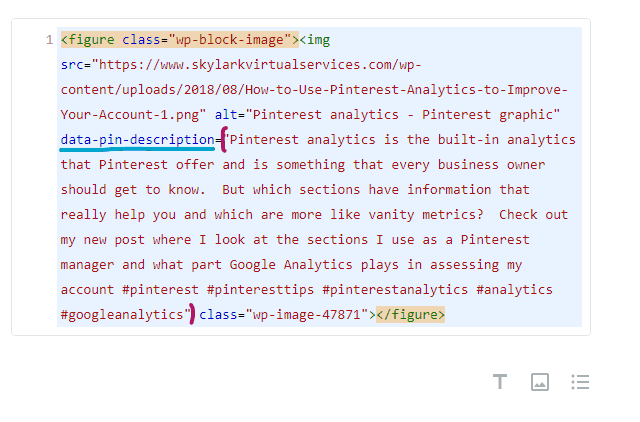 When I first started blogging, the general recommendation for the Pinterest description was to add it to the ALT text. But this isn’t the best idea because the purpose of the ALT text is to help users who can’t see the image know what it is about. So it is better to add keywords and a short description rather than a full Pinterest description. You can use a plugin to do the job – I also people who use Tasty Pins and Social Pug is another being mentioned quite often. But currently, for this blog, I’m simply using a little bit of code to add the description to the actual image and it seems to work nicely. Add your description between the speech marks, making sure there are no spaces. Then go to your post and find the HTML code for the image (if you are using Gutenberg you can just hit the three dots and the HTML option is there). Find the speech marks after the alt text and add a space then paste your description. For Gutenberg, I then tell it to keep the block as HTML – looks weird on the backend but the image is there fine when you preview the post. When someone goes to pin from your site, the image will then appear with your optimised Pinterest description. No more just the title or anything! Another really important step in making your blog optimised for Pinterest is to make it easy for people to pin your images. There’s no need to be subtle about this – a big, bold button that shouts ‘pin it’ or something similar will do the job nicely. I use some custom buttons created by Kimi Kinsey that you can see on her website. She also includes very clear instructions on how to add them – there’s a simple plugin and a few minutes work. Then you have custom, eye-catching buttons that appear when anyone hovers on the image, prompting them to pin it. In the theme of making it obvious and easy to share your stuff, then share buttons are the next step. There are a few different plugins you can use for this – Sumo offers a free version for sharing buttons and if you have Elegant Themes, you can use their Monarch sharing plugin. They also have that handy little top banner bar you see when you first come to the site which can be used for all sorts of things. Whatever you choose, look for responsive buttons that change according to the device someone is on. Along the button is a good option, just under the header image is another and along the side can also work. Don’t go too mad but make it easy for people to share your stuff. If you want to get people onto your Pinterest profile when they finish reading your great stuff, you can create a Pinterest follow button. To do this, you need to visit the Pinterest Developer page where you can make a range of different little features to add to your website. The follow button creates a little piece of code you can add where you want the button to appear along with a bit to go in the body. That’s not all the widget builder does. You can also create a widget for a board, your profile or even a pin that is customised to your account. Let’s say you have a blog board that is just your own stuff. You can create a widget for it, get the code and add it to the home page of your site, your sidebar or anywhere else. When someone clicks on it, they will be taken to that board to see all of the content. As you can see, there are lots of little jobs to do when you are optimising for Pinterest. But they are worth it because people are much more likely to share your content if it is easy to do and you have prompts to get them to do it. And those Pinterest shares count as new pins, in front of a new audience and getting repins, which is the whole point of Pinterest marketing. If you have any questions about optimising for Pinterest or any of your own tips on how you have seen success, pop it in the comments below!